The dream location of Enotel Lido Madeira makes it an ideal choice as accommodation during your holidays. It is located five minutes from the city centre and offers beautiful views of the seafront, as well as having direct access to the sea. The hotel bus will take you to the town of Funchal, allowing you to make excursions or go to different shops, shops and restaurants. This luxury hotel was opened in 2000. It has ten floors and has a total of 240 double rooms and 47 suites. 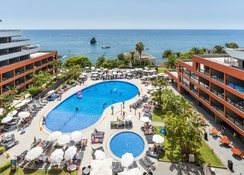 Enotel Lido Madeira has a lobby with a reception area open 24 hours a day, a hairdressing salon, a bar, a nightclub, a TV room and an air-conditioned restaurant. It also has an Internet terminal and a children's club. You can park your car in the parking lot or in the garage of the hotel itself. Room and laundry services are included in the wide range of services. 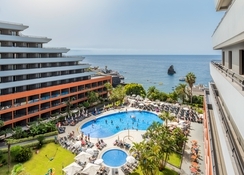 Enotel Lido Madeira is about 10 minutes’ walk from the centre of the town. The shopping centre at Forum Madeira is just about a two minutes’ walk from the hotel. The nearest airport is the Madeira Airport at 25km from the hotel. 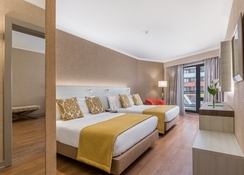 The rooms at Enotel Lido Madeira are furnished in good style and are equipped with a bathroom, hairdryer, direct dial telephone, satellite / cable TV, Internet access, minibar / fridge, air conditioning, hire safe, balcony or terrace and central heating. Both breakfast and dinner are served in buffet style. You have the possibility to book half board as well. There are different breakfast options available: either a buffet breakfast or a breakfast in the room. The hotel restaurant also offers vegetarian, diabetic specialties. In the immediate vicinity there are numerous restaurants. An example is the café-restaurant Fora d'Horas, the restaurant O Chef as well as the restaurant Lareira Portuguesa. Visit the wellness area with fitness centre, Jacuzzi, solarium and steam bath. Massages and body treatments are offered in the massage and beauty area. 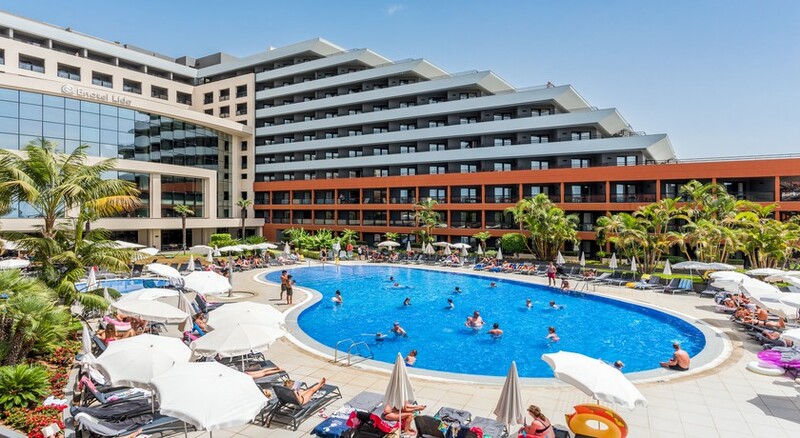 The hotel offers recreational activities such as squash, table tennis, billiards, darts or volleyball. The playground and the playroom invite children to fun. Child care can be booked at the hotel reception. Guests can also go horseback riding and diving in the vicinity of the hotel. For evening entertainment, the hotel features a discotheque. We stayed here in September; it was lovely. The Animation staff were brilliant, the entertainment was good. The All Inclusive was 'proper' and the food was varied and excellent. It was great to have the option to book at the other 2 restaurants as well. The location was lovely, about 35 mins walk to town on a 5EUR taxi. The spa was amazing, with a lovely twilight pool and the therapists were great. We'd recommend and stay here again! We recently stayed here for our honeymoon and it was absolutely amazing! The hotel was fab in every way. The food wasn’t all to our taste but the on site restaurants were amazing. Madeira is amazing we will definitely return. We had a perfect honeymoon.